When embarking on a new health kick, you may find yourself inundated with articles and tips for healthy eating as you scour the internet, newspaper and magazines for tips and advice. Such articles, with the conflicting and often confusing advice hammered out, can leave you feeling despondent as to the best course of action to take? Indeed, media hype often focuses, again and again, on the high levels of sugar in breakfast cereals, as though this is somehow “news”? 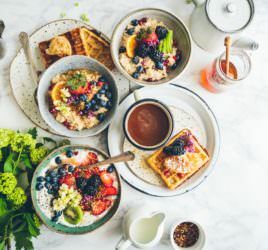 We’ve long known that breakfast cereals are loaded with sugar and worse still, clever marketing and PR means that, worryingly, many unhealthy varieties are still a regular staple at the breakfast table. I’m often asked which cereals are the best choices? The answer is quite simply, apart from porridge oats, none of them. As a nutritionist, the cereal aisle in the supermarket is one that I avoid altogether, unless I’m due a re-stock of unadulterated porridge oats; wholegrain and preferably organic. The latest surveys into our dietary habits indicate that most children are eating over double the recommended daily sugar intake and that sugar makes up far more than the recommended 5% of their total daily calorie intake – 13% for children and 15% for teenagers. Adults come in at 12%, but all way too high. Despite the strong message that sugar is “bad for our health”, these figures have changed little since 2008. A diet that is high in sugar significantly increases the risk of developing heart disease, type 2 diabetes and some cancers but can also have significant effects on your energy levels and your ability to cope, leading in some cases to more pronounced symptoms of otherwise normal health imbalances. For example, symptoms due to hormonal changes from PMS or menopause or everyday stress can be exacerbated with bad blood sugar management. So, if you want to make one effective change to support your health, avoid the usual breakfast cereals. Admittedly, some brands are available with no added sugar and but this often still means too much sugar. If you’re used to sweet foods, your taste buds may take some time to adjust but once you start to reduce your sugar intake, you will notice a difference in just 10-14 days, when sweet foods that you used to enjoy will taste too sweet. The good news is that you will feel the benefits of eating less sugar almost immediately. Whether you’re looking to lose a few pounds, balance your hormones or simply feel less tired and more energized, getting your blood sugars in balance at the beginning of the day is key. Avoiding refined sugars will mean that you avoid the sugar surges and the inevitable dips that follow, which leave you feeling lightheaded, dizzy and perhaps irritable or cranky. The cravings soon kick in as your blood sugar dips; your body is very clever, if you’re low in blood sugar, your brain very quickly receives strong messages to eat more sugar and these messages are very hard to overcome. Starting your day with a high sugar breakfast cereal is a sure way to kick off this cycle of sugar surges and sugar dips and will make your day harder to get through. Avoiding the sugary breakfast cereals and opting for healthier, low sugar choices will ensure you start your day feeling energized and invigorated, with better concentration and focus throughout the morning. Some days you will have more time to spend in the kitchen, perhaps at the weekends or if you’re working from home, whilst on other days you will need to consider preparing a breakfast you can take with you. Start saving your larger glass jars for an ideal and secure option to transport your breakfast. Eggs, poached, fried in a little butter, scrambled or omelette served with wilted spinach, sautéed mushrooms and tomatoes. Keep frozen leaf spinach in the freezer for ease and convenience. Porridge made with water, semi-skimmed cow’s milk or any other nut milk and 1tablespoon Chia seeds, for added fibre, protein and anti-inflammatory Omega 3s. Note, cow’s milk has a higher protein content and therefore will keep you fuller for longer. Top with chopped or grated apple, 1 tablespoon flaked almonds and a good sprinkle of “sweet tasting” cinnamon. Alternatively, make up a batch of Overnight Oats; combine 1 cup oats with ½ cup yoghurt (any), 1 cup milk (any), 1 cup orange juice, 1 tablespoon chia seeds, 1 grated apple. Leave to soak overnight adding more liquid if necessary in the morning. Top with berries or any other seasonal fruit and a small handful of chopped nuts. This is an ideal portable breakfast too. Natural Greek yoghurt (as opposed to “Greek Style”) which has higher protein content or coconut yoghurt. Try 2 or 3 large tablespoons with fruits such as berries, from frozen if fresh are not available out of season or any other seasonal varieties and sprinkle with 1 tablespoon seeds, such as Chia or pumpkin seeds, for added protein and fibre. Breakfast smoothies with Greek or coconut yoghurt, oats, chia seeds, 1tablespoon good quality nut butter, along with a combination of any 2 vegetables, such as spinach and celery, kale, lettuce and 1 portion of any seasonal fruit. Frozen fruits and vegetables work well too. If you’re looking to increase your protein, a scoop of good quality protein powder can be added. Sourdough toast with smashed avocado, chilli flakes, freshly squeezed lemon juice, salt & pepper and a drizzle of olive oil. Try a sprinkle of smoked paprika or finely chopped garlic to add variety. If you’re drinking your coffee and tea black, you will be making a saving in terms of calories. These daily intakes of milk or cream may seem small, but on a regular basis, the additional calories add up and have an impact on your overall calorie intake. A recent American study indicates that many tea and coffee drinkers are regularly adding calories to add variety or improve the flavour of their drinks but without being fully aware of the additional calorie or nutritional implications. Sugar, cream and extra sweet syrups are all calorie dense and of low nutritional value. In the first instance, avoid any syrups, flavourings or toppings with any beverage and opt for cappuccinos or even a macchiato, rather than lattes, which use less milk. In the longer term, consider drinking your tea and coffee black once you’re palate adapts to a lighter choice. So if there’s one key change to make to kick start a healthy lifestyle, make it breakfast!